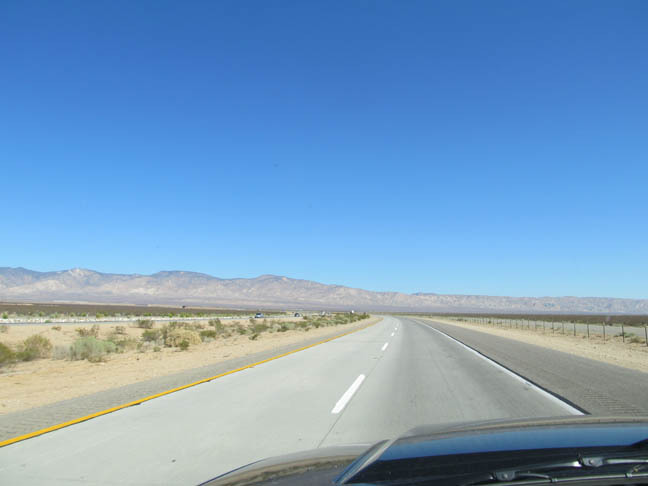 I snapped this as we entered the Mojave Desert in Arizona. 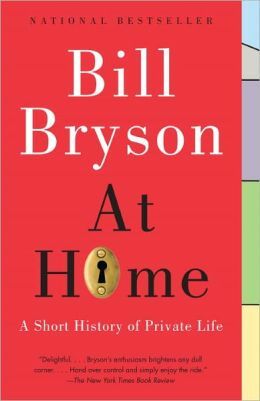 We were listening to Bill Bryson read his book, which helped, at first. My wife and I listened to 2.4 audio books last week as we drove to California on vacation. We put 4,000 miles on our rental car, one way. We saw lovely things, like the Painted Desert, the Petrified Forest, and the red cliffs of Sedona, Arizona, where we rested up for a day. Then the endless Mojave Desert of Arizona-California caused me to whimper. While it did break my spirit, I dispute my wife’s assertion—however funny her impersonation of me—that I became catatonic as I drove. But look, I’m a once and future southern boy, a child of green and humid places. When the bare earth between plants stretches to more than a few feet, I get queasy. Anyway, given the vast ranges we traversed in Oklahoma, Texas, New Mexico, and Arizona, you’d think we would have made more of a dent in the pile of audio books I checked out from the library. We started with a short work, David Sedaris’s Holidays on Ice, most of which we’d heard on NPR over years—though I had to wonder if we’d really ever heard all of his famous story about working as a Macy’s elf: like the rest of the collection, it’s hilarious but far sadder and darker than I remembered, maybe an effect of listening to one Sedaris story after another. From the elevated . . . The bulk of the trip we spent with the dozen or so CDs of Bill Bryson’s At Home: A Short History of Private Life, which is history for us ordinary folk who haven’t always paid close attention to history—because history sometimes requires that you know more history than you do. Bryson read it himself, and we loved his arch delivery, even if I never could reconcile his ritzy British accent with his photos that show him as the ruddy, beefy man from Iowa that he is. We finished up, driving through California’s fecund central valley, a true agrarian Eden, with Jennifer Egan’s remarkable novel A Visit from the Goon Squad. What a talent she is. One day I’ll finish this book, but I did hear enough to learn that the goons are a wonderful metaphor for aging. We flew back to Ohio from San Francisco, an experience almost as arduous as the drive. I reaffirmed my sole pre-existing bit of travel knowledge, which is never to fly United Airlines, and added a second caveat, which is to beware the infamous red-eye in which you fly all night. Especially if you take off late, miss your connecting flight, learn they’ve lost your luggage, and must return to the airport to fetch it so bleary you can hardly see. On the other hand, never once during our travels did we feel menaced or experience anyone’s road rage—and we were astonished in the West by the politeness of the drivers, who kept mostly to the 75 mph speed limits and never tailgated. They made drivers in my current home state of Ohio resemble those of the angry Eastern seaboard. During our return ordeal, at least I did manage to finish re-reading Rebecca Solnit’s impressive The Faraway Nearby. I’d wondered if I’d agree with my recent review, specifically the four stars I assigned the book instead of five in my Goodreads condensation. By the time I closed the cover in Chicago’s O’Hare Airport, I’d also read a few more reviews and interviews. Hard to believe it didn’t get a notice in The New York Times Book Review—at least I can’t find one—though I know that their commissioned reviews get spiked for various reasons, including if they don’t like a review itself for some reason. I’d hoped for more perspective than reviews by her followers supply. For me personally, it is a very important book. I was aware the second time of where my attention drifted and why, and forced myself to come back, to stay with it, to see the structural reason. The personal, memoir aspect of The Faraway Nearby suffuses it even more than I’d consciously noticed, and is the engine that pulled me through—and I suspect what hooks and retains other readers. Of course, The Faraway Nearby is its own book, and like all great books teaches you how to read it. And Solnit is writing almost always from a far remove, the intellectual at her desk in some current now; this supplies and strengthens perspective and meaning but really muffles her lived experience. I admire and respect The Faraway Nearby as a reader and writer, and usually enjoyed it, but sometimes it gets too unmoored from life for my middle-brow taste. Then again, now I know how to read Solnit. And Solnit, as a moral intellectual, as a spiritual person, and as a genuine creature of literature, is worth a bit of work. Re-reading The Faraway Nearby puts my total books read so far for the year at a lowly 42—I count re-reads, and I admit I’ve also counted Sedaris and Bryson. I rarely count skim-reads. But I’ll mention one here, skim-read just before my trip west, Confessions of a Sociopath: A Life Spent Hiding in Plain Sight by M.E. Thomas (Crown, 302 pp.). It was offered to me as a review copy and I accepted in a moment of weakness. I presume I’m like most people in that evil interests me. That’s because the real news about people is their pervasive goodness and the everlasting mystery of goodness. Hence the mesmerizing quality of badness and the drama that flows from it. You might say that literature owes a lot to badness, literally to social pathology, though how much is owed to sociopaths per se is hard to say. The example the Confessions of a Sociopath keeps citing is John Steinbeck’s character Cathy in East of Eden. Even so, normal humans identify, in drama as in life, with heroes and victims. So an entire first-person account by a sociopath must overcome what would seem an impossible hurdle. Very soon indeed, I found its author tiresome. 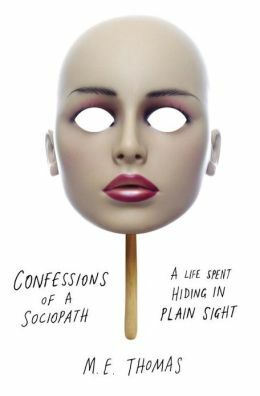 Confessions of a Sociopath owes its existence to the author’s blog, SociopathWorld, and to a sharp-eyed agent who apparently actually did what writers fantasize about and approached Thomas. The author uses M. E. Thomas as a pseudonym, since she’s a professional woman. A lawyer, to be exact. Though brilliant, by her own account and by her reported IQ score, she couldn’t make it in law firms—too lazy—but thrives among us as . . . a brassy professor of law. Cue the lawyer and/or professor jokes. My own: Good luck hunting her down! Thomas’s most interesting argument is that sociopaths are helpful to society, a genetic and even evolutionary adaptation, useful for certain tasks and occupations that kill normal folk from stress and guilt. Thomas hasn’t killed anyone, though she’s been tempted, but instead has toyed with, used, and destroyed people in various ways. She seizes on and exploits weakness—that is, niceness. Her genetic package was triggered in an emotionally dysfunctional family (Solnit’s sounds at least as bad), which comes off as her play to be somewhat of a victim. She tries to make it sound great to be a sociopath, however, someone unencumbered by conscience or remorse. Actually she most resembles, in her maudlin self regard, an Ayn Rand hero, who, you’ll recall, are as cool and misunderstood as vampires. The fact that by definition she’s inhuman, being hollow at the core, would seem to be more of a liability for her as a writer than it actually appears to be, except in one area. If Solnit relies on her persona very little, and favors a cool, cerebral, and distanced one, Thomas is all distanced persona, though one full of attitude, rationalization, and justification. On and on. What all normal and sociopathic readers want here, however, is rendered experience. She’s a good writer, but for a book like this there aren’t enough scenes of her doing bad things. Too much summary, kid! More blood and guts, so to speak. Instead, she’s talky as hell. Though she says people find her fascinating, even mesmerizing, with her intensity and feral confidence, I imagine more folks dislike and avoid her, if she’s anything like the persona she projects in this book. I reviewed Solnit’s book in the previous post. HI, Richard. Well, it sounds like you’ve had a full reading summer, at any rate, or end of summer. I’ve been trying for weeks to finish “Absurdistan,” because it’s a political satire for our times which has been compared to Thomas Pynchon. Finally, yesterday I managed to finish it; guess what? It’s nowhere near as talented as Pynchon, and has a lot more gratuitous sexual activity and language and longueurs that Pynchon never dreamed of having. It just doesn’t move fast enough. I could do with some Sedaris right now, sad or not, or some Woolf or even Steinbeck, just to reassure me that literary has a higher purpose than just entertainment! I hope you enjoyed your vacation (treeless desert aside) and are ready to go on to the teaching stage this semester. Often when I was teaching, I got information about books from my students, who had read them and wanted to know how to interpret something in them, or who wanted to check to see if my opinion tallied with their own. At any rate, I know you’ll be busy; I hope you’ll still have plenty of time for this great blog. Thanks so much, Victoria. Isn’t it interesting indeed the experience of a reader? So interesting to read great and not so great books and have reactions, opinions, passions, and hatreds! I enjoyed this “Travels with Charley” series. The trip through the desert and the horrible red-eye prepared you to flay any book that doesn’t have a soul. Ha! What a great interpretation, Shirley. I have to agree, if only because it’s so flattering. But oh how I wish we had had our Charley—little Belle, our pound rescue terrier with separation anxiety, who spent 12 days kenneled at our vet’s. Never had we boarded her that long, and she let her displeasure be known by chewing up her own comfy bed I’d provided to say “We love you and we’ll be back.” Plus Belle got fleas, so there I was yesterday, still jet lagged and with a swollen and smarting toe I’d just broken getting into our shower, shampooing her in our guest bathtub. Another excellent and informative blog, Richard. Thank you! It’s interesting how we respond so viscerally to landscape. I felt similarly about the desert — I tend to seek out meadows, myself — but my husband felt upon approaching that empty, hot terrain that he had entered his element. Yet both of us grew up in northeast Ohio. Something in the bones, perhaps. I know, it’s weird, Marsha. I think I actually responded more favorably overall to the West, especially the vast ranges, which I find romantic, than did my wife—and I love the chili culture. But I lost it in the Mojave! Interesting that you begin with Sedaris and end with a sociopath in the desert. It seems many people lose it in the Mojave. I imagine Steven Crane spent a lot of time “In the Desert” before he wrote his famous poem. Glad to know you made it home safely. Take care of that toe. Thank you, Darrelyn. How nice to be associated with Crane . . . and now I want to peruse Mojave writings—I seem to remember a Capote story, maybe part of Answered Prayers. I imagine you saw the review of “The Faraway Nearby” in today’s (Sunday, August 18) NYTBR. The reviewer, Robin Romm, was not entirely taken with it. You can see for yourself. I liked Solnit’s “A Field Guide to Getting Lost” — especially the piece about the distance of blue (I think that was it) but there’s something about her that is a little too abstract at times for me–as if she’s intoxicated with the language and it gets away from her, in the sense that you can’t really get a handle on what she’s saying. Or maybe the lack is in me–so often the case! She is wonderfully original and doing interesting stuff in her writing, though. Happy travels, Richard. Hi Paulette, good to hear from you. No, I haven’t seen the review in today’s Times and am grateful you mentioned it—seems to be coming in kind of late, but addresses my puzzlement about how they could ignore such a book. Interesting too that their reviewer has issues with The Faraway Nearby. I’m going there now to compare notes . . .